Working Americans and their employers each pay 6.2% of wages into Social Security, up to the cap of $118,500 in 2016. [vii] These payroll premiums fund current benefits supplemented by interest from the Trust Fund that has been built up since the 1980s to help cover the retirement of the baby boom generation. The average monthly benefit is $1,182.24. Social Security benefits are progressive, meaning that benefits replace a higher percentage of earnings for low wage workers than for high wage workers. But those with higher lifetime incomes still receive more in benefits. 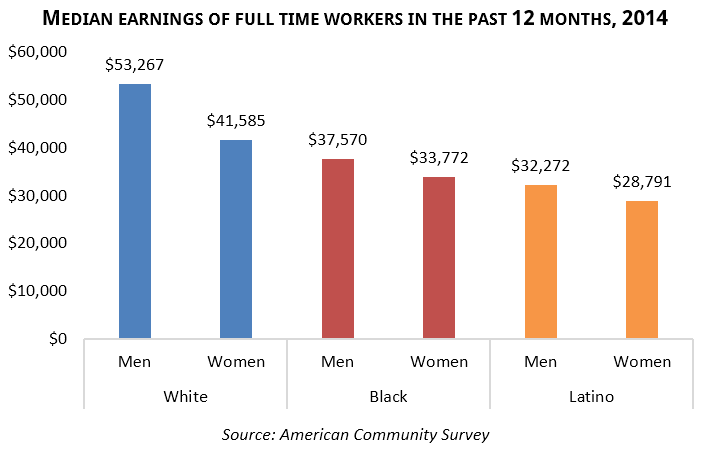 The gender and racial wage and opportunity gaps, and women’s greater likelihood of taking time out of the workforce or working a reduced schedule for family care, therefore ultimately affect the size of benefits. Reducing wage inequality would go a long way toward assuring secure retirements for all workers, as well as bolstering Social Security’s finances and long-term sustainability. Although Social Security kept 21.4 million Americans out poverty in 2014,[x] benefits can be expanded to better protect the financial and retirement security of the much larger number of people who are just scraping by, particularly older women and people of color. [xi] The simplest way to do that is to adjust the benefit formula to raise benefits for those who have spent their careers in low wage occupations – such as childcare, restaurant service, or home health care. Living to extreme old age and outliving or not having a spouse greatly increase the risk of poverty. “Bump-ups” in benefits for seniors living past a certain age, and/or increasing benefits for elderly widows and widowers, would reduce financial insecurity among the most vulnerable. Caring for children or aging family members can cause a lot of people, especially women, to reduce their hours or stop working altogether, greatly impacting their retirement benefits. Reducing the number of years’ earnings used to calculate retirement benefits from 35 to 30 or 28 would be the simplest way to eliminate the caregiving penalty, as well as benefit those who had reduced access to employment because of economic or other circumstances. Social Security’s Trustees and actuaries annually project the program’s financing 75 years into the future. In 2016, they predicted the system could pay full scheduled benefits through 2034, then could cover 79% of expected benefits. [xiii] With the current contributions cap of $118,500, the majority of workers pay on their entire earnings all year, while those with the highest salaries contribute only for part of the year. Eliminating the cap immediately would tax all workers equally, help finance benefit expansion, and secure the program for future generations. [i] U.S. Social Security Administration, Number of beneficiaries receiving benefits on December 31, 1970-2015, https://www.ssa.gov/oact/STATS/OASDIbenies.html. [ii] U.S. Census Bureau, American Community Survey 2015, Selected Economic Characteristics for Washington, 1-year estimates. 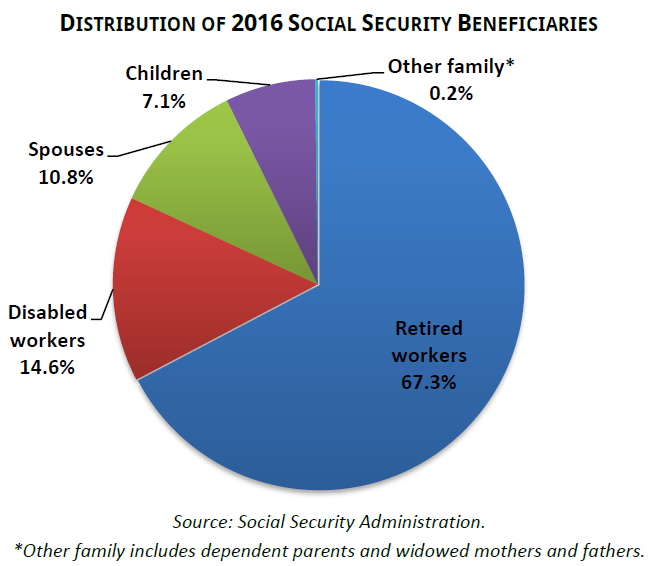 [iii] U.S. Social Security Administration, Income of the Population 55 or Older, 2014, https://www.ssa.gov/policy/docs/statcomps/income_pop55/. [iv] The Gerontology Institute, University of Massachusetts Boston, The Elder Economic Security Initiative: The Elder Economic Security Standard Index for Washington, 2011, http://www.wowonline.org/documents/WashingtonElderIndexReport.pdf. [v] U.S. Social Security Administration, Income of the Population 55 or Older, 2014, https://www.ssa.gov/policy/docs/statcomps/income_pop55/. [vi] Center for Global Policy Solutions, Overlooked But Not Forgotten: Social Security Lifts Millions More Children Out Of Poverty, July 2016, http://globalpolicysolutions.org/report/overlooked-not-forgotten-social-security-lifts-millions-children-poverty/. 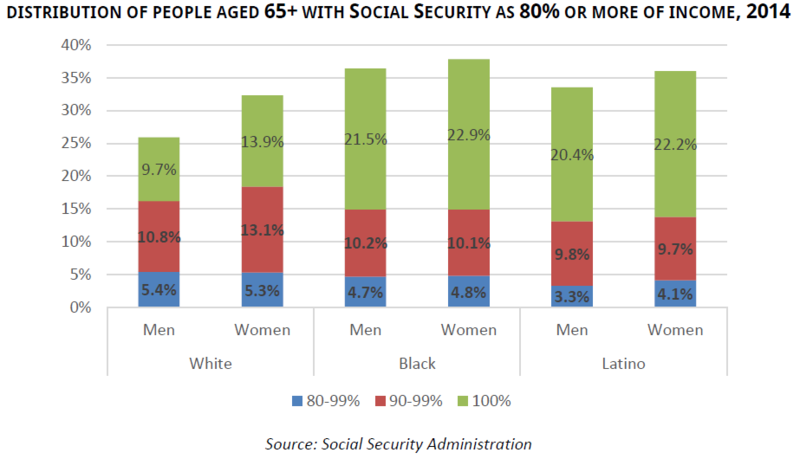 [vii] Edwards KA, Turner A, and Hertel-Fernandez A, Economic Policy Institute, A Young Person’s Guide to Social Security, 2016, http://www.epi.org/files/2016/young_person%27s_guide_to_social_security_3rd_edition_optimized.pdf. [viii] U.S. Social Security Administration, “Social Security is Important to Women,” and “Hispanics and Social Security,” viewed August 4, 2016, https://www.ssa.gov/people/. [x] DeNavas-Walt C and Proctor BD, U.S. Census Bureau, Current Population Reports, Income and Poverty in the United States: 2014, 2015, https://www.census.gov/content/dam/Census/library/publications/2015/demo/p60-252.pdf. [xi] Hartmann H, Institute for Women’s Policy Research, Enhancing Social Security for Women and other Vulnerable Americans: What the Experts Say, 2014, http://iwpr.org/publications/pubs/enhancing-social-security-for-women-and-other-vulnerable-americans-what-the-experts-say. [xii] Edwards KA, Turner A, and Hertel-Fernandez A, Economic Policy Institute, A Young Person’s Guide to Social Security, 2016, http://www.epi.org/files/2016/young_person%27s_guide_to_social_security_3rd_edition_optimized.pdf. [xiii] U.S. Social Security Administration, 2016 Annual Report of the Board of Trustees, https://www.ssa.gov/OACT/TR/2016/tr2016.pdf.